A smartphone app I really find useful in my wanderings is RadarNow! What it does is link you to regional airport radar not in real time, but in six minute delayed bursts. So if it's 3pm RadarNow! shows you radar shots from 2:30, 2:36, 2:42, 2:48 up to 2:54. The display looks just like the radar shots the TV weather guys show you when there's a storm coming in. The app uses your phone's GPS to put a little blue dot in the middle of the screen which is you so you can see where nasty weather is (and is going to) relative to your current position. RadarNow! 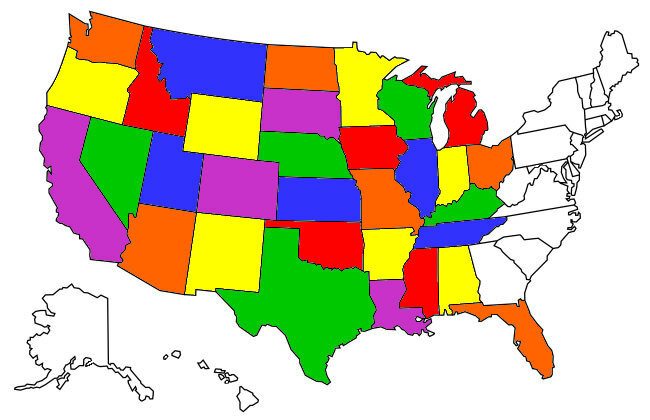 also sends weather alerts like severe thunderstorms or severe heat to your smartphone. Best of all it's free! 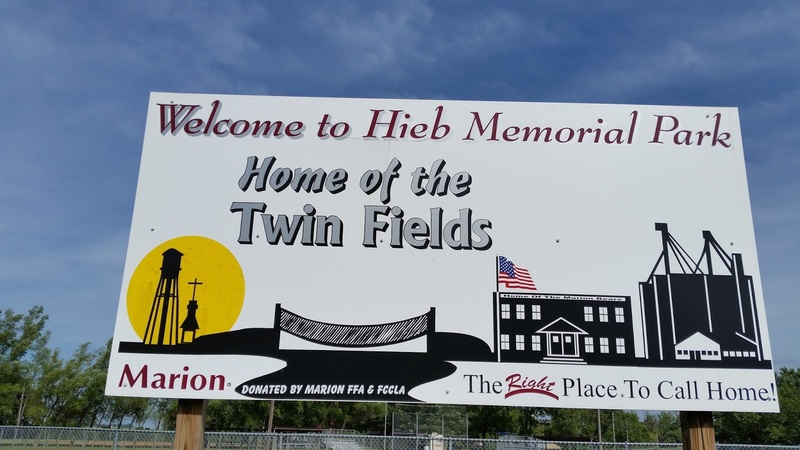 Anyway that was a long-winded way of explaining why I ended up at Hieb Park in the tiny town of Marion, South Dakota. The RadarNow! 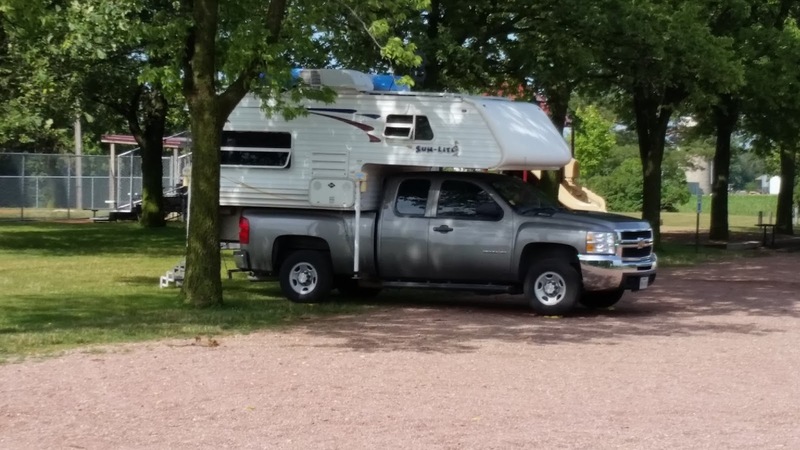 app had sent an alert to my smartphone warning of a severe heat wave in the area lasting for at least four days, I realized I needed to find a campsite with electricity to run the Tank's AC (the Tank's solar power can't generate the huge initial draw air-conditioners require at start). Using my favorite free campsite website, Freecampsites.net I found that not only did nearby Marion's park allow for free camping for up to seven days, it also provided FREE electrical hookups! I headed towards Hieb Park. 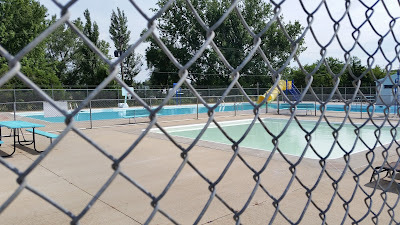 Marion is a small town that's seen better economic times judging by the many closed businesses I saw as I drove down their main street but Hieb Park is a really nicely maintained park boasting of two ball fields with lights and stands and an outdoor swimming pool. 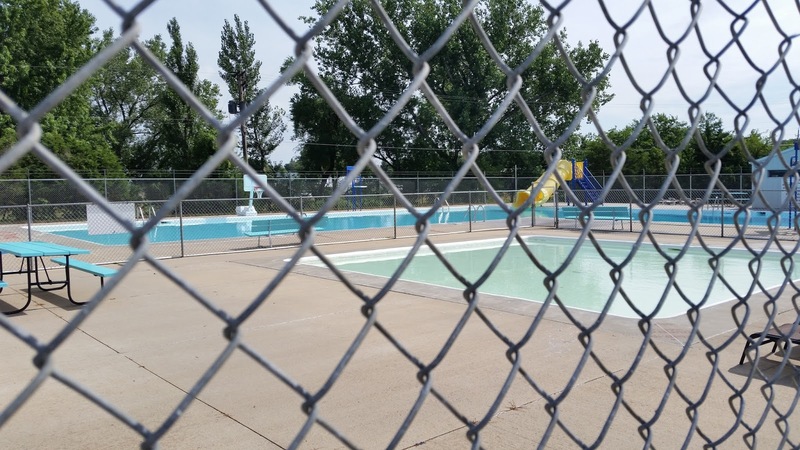 The pool complex had an adult pool and a kids wading pool. 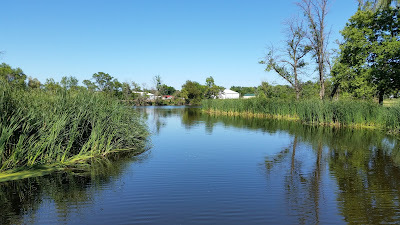 There were three RV areas with hookups, totally seven sites in all and I got the last one which was fortunate for me as it was a Friday afternoon when I got there. No worries about sun hitting the Tank's solar panels with electric hookups. In addition to the swimming pool there's a small stream that feeds a large pond on one side of the park. There was even a neat little foot bridge that crossed the pond that I guess you could fish off of. 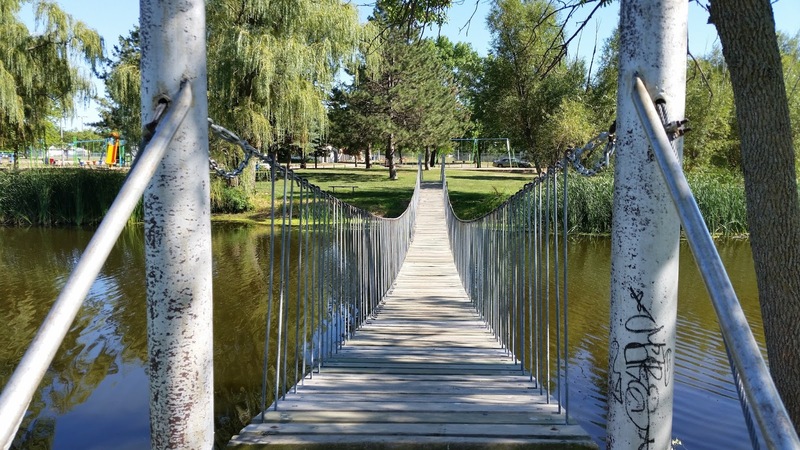 This foot bridge gets you back to your RV without walking around the pond. Whenever I stay at a park that supplies free hookups I try to spend money at the town's businesses to show my appreciation, after all the townsfolk are footing the electric bill at the end of the month. I ate breakfast at a traditional little diner only a block from the park and the Country Breakfast on the menu there (I can't remember the diner's name but there's only one in town) is highly recommended! I also stopped at the hardware store and bought some stuff I needed to do some minor repairs on the Tank. RadarNow! predicted high temperatures and for my three day stay in Marion it was spot on, the Tank's AC ran all day long it seemed. I was grateful for the electricity, it would have been really uncomfortable without it. 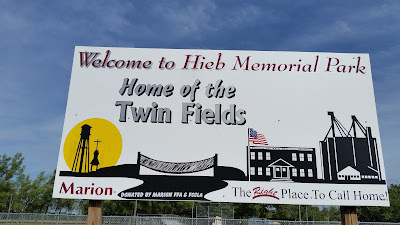 Hieb Memorial Park is a really nice city park that I would recommend to anyone passing through Marion's part of South Dakota!